SEND me some videos of YOUR RIDE!!! Now that digital video cameras have been widely available for several years, and with the advent of websites such as Youtube that provide a forum for amateurs to post short videos of just about anything, more and more video of Pontiacs of all types have become more widely available. In keeping with the times I would like to adjust the format of the Gallery to include video content that features members cars. 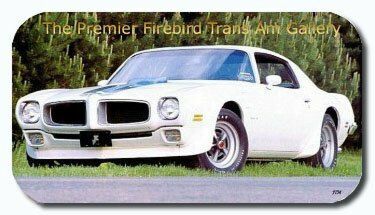 If your Firebird is already here on the site and you have the capability to send in some short videos of it, please feel free to send them in and I'll add them with your entry. If your new to the site and are planning to submit an entry please consider including a short video of your Firebird to send along with the pics and text. Lastly, if you're Firebird is already on the site please make sure I have your most current e-mail address and send me updated pics and/or information if the content currently on the site is out of date. the TAs inspired by his artwork. Click the link below for more information on Kevin's designs and the new Trans Am being developed in his name. Year One has been working to transform a number of 77-81 TAs into Super TAs!! Copyright © 1997 - 2010 FirebirdGallery.com All rights reserved. All content contained with this site, including images and text is the sole property of FirebirdGallery.com. Images may be download for personal use however, reproduction or re-use of any of the content on any part of the site is strictly prohibited without written permission from the webmaster.